Prom is just around the corner, which means teens everywhere have been taking deep breaths and asking their crushes to the prom with adorable promposals. But this kid just won the promposal game. To be honest, the idea of a promposal is pretty foreign to me, and the idea of an elaborate promposal is practically extraterrestrial. I’ve been on the fence about them, especially when clueless kids start strapping faux explosives to themselves in a bid to be the dumbest ever. 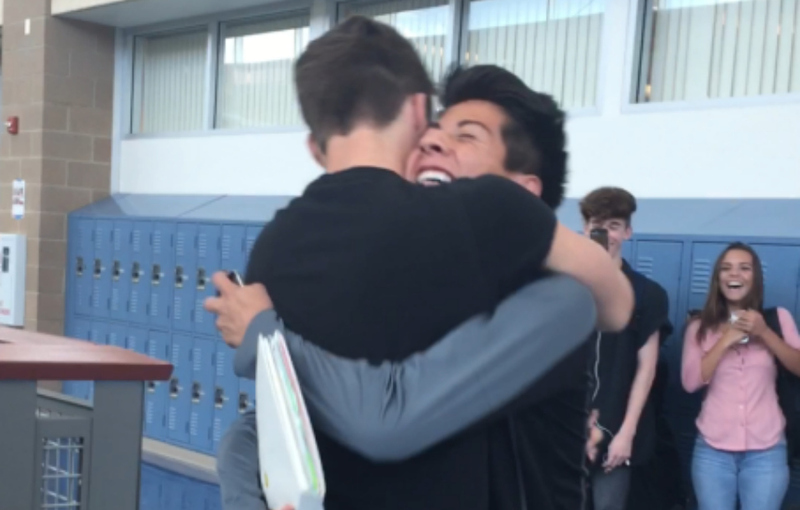 But this adorable story of a straight boy asking his gay friend to the prom is so sweet that I think I’m officially pro-promposal. A Las Vegas teen, Anthony Martinez, wanted what we all once wanted during our respective prom seasons: a date to the prom. Specifically, he wanted a guy to be his date, because he’s gay. Being a gay teen isn’t always a walk in the park, obviously, so this is sometimes easier said than done. I DONT WANT TO DATE YOU I JUST WANT A GUY AS A DATE TO PROM. I ALWAYS HELP WITH DANCES ITD BE NICE TO GET ASKED TO ONE. What’s more is that Anthony regularly helps plan school dances, so who could possibly blame him for wanting to, I don’t know, actually attend one with a date? I love this. I love this so much that I want to buy it a corsage, put on a nice dress and prompose to it in the most elaborate fashion possible. Because Jacob wasn’t afraid to give his friend the night he wanted and deserved, Anthony got to experience something that a lot of straight teens take for granted — being asked, publicly, to a dance. Anthony said yes, obviously. Together these two have already won prom, so all you other teens out there can stop trying. Everyone here is awesome. Anthony is awesome for planning dance after dance without expecting anything in return. Jacob is awesome for being an empathetic and attentive friend and seeing a simple way to make someone else’s prom special. Even the people holding up the sign are awesome for being a part of it, and even though all I can see is their feet, I want to hug them regardless. Can I please get an “amen”? Or at least a heartfelt “squee”?